← Sowing Agile Seeds in the User Community! That was from the US Bureau of National Affairs. Did it get your attention? Then read on! What makes one company more successful than another? Better products, services, strategies, technologies or, perhaps, a better cost structure? Certainly, all of these contribute to superior performance, but all of them can be copied over time. The one thing that creates sustainable competitive advantage – and therefore ROI, company value and long-term strength – is the workforce, the people who are the company. And when it comes to people, research has shown, time and again, that employees who are engaged significantly outperform work groups that are not engaged. In the fight for competitive advantage where employees are the differentiator, engaged employees are the ultimate goal. Employees said that it is the personal relationship with their immediate supervisor that is the key. The attitude and actions of the immediate supervisor can enhance employee engagement or can create an atmosphere where an employee becomes disengaged. In addition, employees said that believing in the ability of senior leadership to take their input, lead the company in the right direction and openly communicate the state of the organization is key in driving engagement. Other factors that drive engagement are that employees are treated with respect, that their personal values are reflected and that the organization cares about how they feel. Among the 1,500 employees, only 29% are fully engaged and 26% are disengaged. Almost half (45%) are partially engaged. The findings from the MSW Research study identify several factors that drive engagement or disengagement. 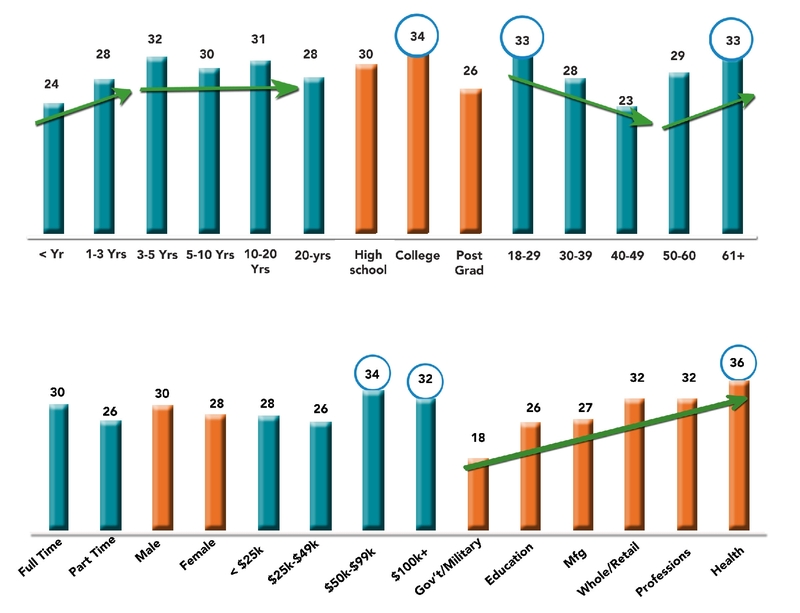 Gender, ethnicity and work status (full/part time) do not emerge as critical variables of employee engagement. Today, employee engagement and loyalty are more vital than ever before to an organization’s success and competitive advantage. Gone are the days when a young person starting out in his or her career joined a company and stayed until retirement – in today’s business environment there are no guarantees. Experts predict the current turnover rate may rise to 65%. With recruiting costs running approximately 1.5 times annual salary, the ability to engage and retain valuable employees has a significant impact on an organization’s bottom line. The question for management is how to ensure that the supervisors interact with individuals to generate an engaged workforce. The study revealed that a “caring” manager is one of the key elements that drives employee engagement. That is, employees want their managers to care about their personal lives, to take an interest in them as people, to care about how they feel and support their health and well-being. A manager’s ability to build strong relationships with employees, build strong team interaction and lead in a “person-centered” way creates an engaging environment in which employees can perform at the highest possible level. Employees are your biggest investment and should bring the greatest reward. Yet even today, in too many organizations, employees are viewed as an asset to be managed rather than as individuals who can create the next innovation for success. Long-term engagement starts with good communication between employer and employees as well as among co-workers, fostering a positive working environment. By working with employees to create a clear career path and set goals with a potential for growth, a manager can create positive esteem within each team member. By showing them that they are valued and have responsibility, and then to recognize and reward them for a job well done, a manager can create an “involved employee.” It is then much easier to turn that sense of involvement into enthusiasm and a sense of pride in ownership that creates the highest levels of engagement with employees. This entry was posted in Agile and Strategic Planning, Agile Arguments, Agile for Beginners, Agile in the Enterprise, Uncategorized and tagged Dale Carnegie, Employee engagement, Human resources. Bookmark the permalink. Thanks for posting this Brian and thanks to Katie as well for her permission to do so, even though this is market material for Dale Carnegie. I did read Katie’s interview and it was very well crafted. Frankly, I was very favorably impressed and I rarely say that. I agree entirely with this whitepaper. The problem as I see it when companies engage professionals like Dale Carnegie they are really looking for sugar pills to fix the workforce disgruntlement and not address very bad management issues and the executive attitude that they know it all and deserve all the high pay. How many companies are out there that you can walk into ghs CEO’s office and tell him the truth about what’s going on or at least what YOU think is the truth and not get fired? How does Dale Carnegie fix THAT? I would love to hear what I am convinced are two very smart and experienced people namely Katie and Brian address that either separately or jointly. This looks similar to your HCM post Brian which quoted Watson Wyatt and Towers Perrin surveys that were older. My question is have things gotten any better? In the last several posts, there seems to be a theme of the importance of agile/communications. Unless I am wrong, however, you are not talking about a communications plan. You are referring to the “skill” of communicating. Is that correct? If so are you going to address it more directly? This is not a criticism. I guess that I am looking for a clue as to what comes next. $11 Billion should get anyone’s attention. As a retired CFO I know all too well the cost of onboarding new employees. To be frank I believe the true figure is even higher. In this figure, you don’t differentiate between the loss of a valued employee from attrition to a competitor, from retirement or for just plan old poor performance reasons. If you have any of those statistical details Katie I believe they would be illuminating. Thanks for sharing this. Thank you for posting this Brian. I found it quite valuable. Please extend my appreciation to Katie as well. 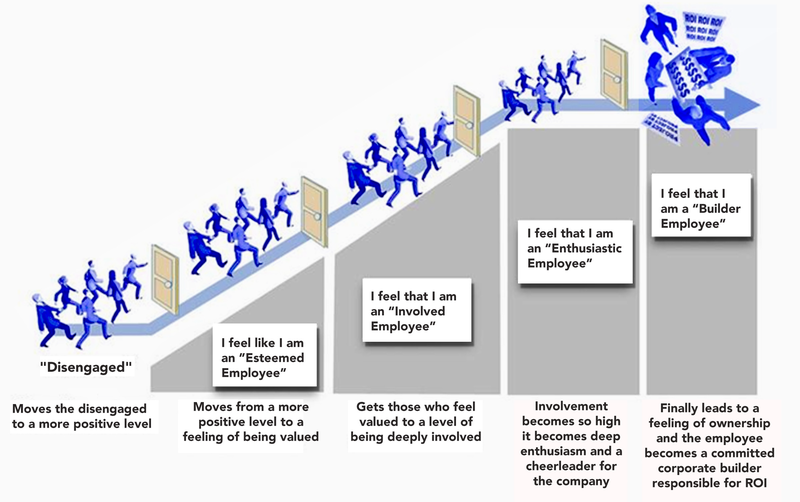 Nice series on Employee Engagement. Good, quality research! Employee engagement is what drives companies so what drives employee engagement is THE critical success factor in business. Thank you for driving this fact home!